Dentistry is composed of many branches. Some of them cater to the overall dental needs of patients, while others are solely focused on fixing teeth imperfections. But if there is a specific branch that delivers both cosmetic and oral health benefits to people, it is restorative dentistry. People suffering from missing teeth can now avail of different treatments to restore their lost smiles – all because of restorative dentistry. Even before, tooth loss had been one of the greatest concern of people. They take advantage of various resources just to have their pearly whites back. They utilize the teeth of dead humans, seashells, and ivories of animals as their teeth replacement. But because technology contributes much to restorative dentistry, people are bound to receive high-quality restoration in a comfortable way. Here at Riverheart Family Dentistry, we have two options for patients: dentures and dental implant restorations. Dentures are removable oral devices that can restore single or multiple lost teeth. The prosthesis can also replace an entire arch of pearly whites. On the other hand, dental implant restoration is dubbed as the gold standard of tooth replacement. It uses an implant to keep crowns or dentures in place. Dental implants do not just retain the visible structure of the teeth but their roots as well. If you have any queries regarding these two, feel free to contact our office. Dental implants and dentures are made from top-quality materials that can withstand for years – implants can even last for a lifetime! Given the appropriate care, the person can enjoy a healthy smile for an extended period. Patients suffering from tooth loss may find it awkward to smile because of how their teeth appear. After replacing it with a prosthesis, they will learn to show their grin confidently again. Tooth loss aggravates the deterioration of dental structures. As a result, the overall oral health, as well as the facial symmetry of the person, is affected. The good news is, dental implants promote the growth of the jawbone once again. 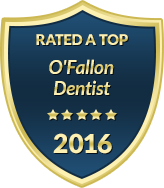 Do not hesitate to avail of our Restorative Dentistry treatments in O’Fallon, MO if you are suffering from missing teeth. Book an appointment with us at Riverheart Family Dentistry!